With solar costs on a strong decline, this clean renewable energy has emerged as a viable power partner for generating cost-effective peak electricity generation, which is projected to increase to 5,000 billion kWh by 2030 from its current level of 4,361 billion kWh gross. According to Energy Information Administration (EIA) data, 42% of the nation’s electricity is generated from coal-fired plants, 25% from natural gas, 19% nuclear and 6.5% from hydroelectric. 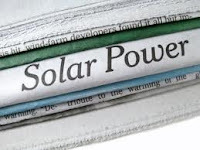 This paper examines the recent past and potential future of photovoltaic (PV) solar in terms of how it has compared with traditional generation and how, even without government subsidies, solar utility-scale projects will reach a price per KWh that will be at — or less than — traditional generation, possibly as soon as 2014. Now is the time for traditional conservative thinking to re-examine the facts about solar energy and explore its potential for not only delivering more efficient and less costly power, but also for creating jobs and opportunities that jump-start economic growth. This jump-start would be possible because electricity drives almost every part of the economy, and cheap abundant electricity keeps industry competitive. Photovoltaic solar essentially is made from one of the Earth’s most abundant resources: silicon. Of the 92 elements found on the periodic table, silicon (Si) is the Earth’s most prevalent semiconductor — and second most common element of any kind, after oxygen. Appearing in silicon oxides such as sand (silica), quartz, rock crystal, amethyst, agate, flint, jasper and opal, silicon makes up about a quarter, by weight, of the Earth’s crust. Furthermore, the fuel source is free (presuming the sun rises). As for cost, in response to growing demand for renewable energy sources, the manufacturing of solar cells and photovoltaic arrays has advanced considerably in recent years. With continued advances in technology and increases in manufacturing scale and sophistication, the cost of PV will continue to decline steadily, resulting in competitive electricity in a growing number of regions. The annual exponential drops in the cost of solar will not only result in competitive electricity, but also in cheaper electricity coupled with higher profit (the hallmark of any successful capitalist system, of course). Concentrated photovoltaic (CPV) technology uses optical devices such as lenses to concentrate large amounts of sunlight onto small areas of solar photovoltaic materials to generate electricity. This was viable when PV was expensive and plastic lenses were cheap. As this paper demonstrates, PV is now low-cost, so CPV is less important. CSP simply uses concentrated sunlight to heat steam, which drives a turbine. At one point in time, CSP was less expensive than PV. This has not been the case for several years. Not only does CSP have all of the moving parts of traditional generation, thousands of mirrors must also track the sun accurately on a daily basis. The expense of these components alone, coupled with the failure rates, defeats the value of potential saving from heat storage and CSP’s ability to generate for periods after the sun has set. For many years, solar power was not a viable alternative source of energy, but the cost of PV went down year after year just as electricity costs rose. From 2005 to 2008, the cost of PV rose and maintained this level in response to significant transitions in the industry. Substantial volumes of solar parks were being constructed in response to the 2004 revisions to the feed-in tariffs in Germany, which created demand for materials on a large scale to meet demands of solar farms. During this time the silicon industry, which had previously produced materials for the microchip manufacturers, adapted and began refinements that would ultimately drive a new trend line in decreasing PV costs. To understand this, one need only to realize that microchips are small, while solar farms are huge. For the past eight years, silicon manufacturers have been developing new methods of mass production on a scale that is (potentially) orders of magnitude greater than historical demand, while simultaneously developing efficiencies to dramatically lower costs. This number is based on the total cost of a system and financing large-scale projects using the same methods for financing a new combined cycle gas-powered generating facility. Referring to the previous chart, we can see that in 2010 PV was approaching $2/watt. 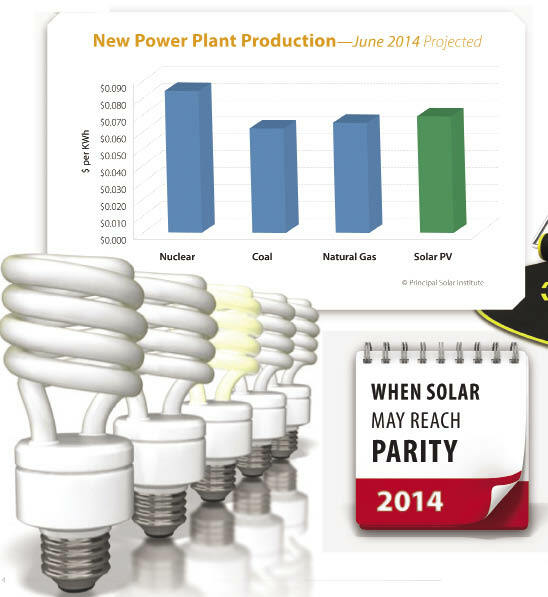 In early 2012, solar PV began to approach grid parity, and it’s almost there. 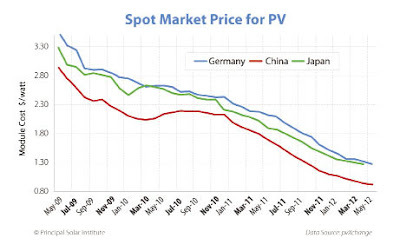 In looking at the spot market price for PV from 2009-2012, note the same downward trend in cost for PV in Germany, China and Japan. Because China has cheaper labor, it’s understandable that this labor-intensive industry produces lower-cost products in China than in Japan and Germany. The chart above shows the May 2012 spot price of (Chinese) PV to be $0.91 per watt. From this trend line, it can be extrapolated that in the next two years, assuming a continuing trend, solar PV may reach $0.70/kWh by 2013 and could be as low as $0.50/kWh by 2014. These numbers are supported by many of the largest solar cell and PV manufacturers. The projected 2014 price will make solar PV not only competitive with — but less expensive than — nuclear, coal and natural gas. 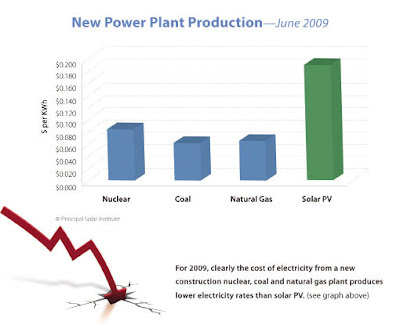 Here’s a look at a 2009 MIT study that evaluated the resulting cost per kWh of new plants that would be constructed in 2009. For this analysis, the cost per kWh (green) of solar built in the same period has been added to the chart. For 2009, clearly the cost of electricity from a new construction nuclear, coal and natural gas plant produces lower electricity rates than solar PV. In 2014, solar and natural gas are level, and coal costs less, although a coal plant will probably cost more to build than it did five years earlier in 2009. From these projections, it can be concluded that 2014 is the year that solar may reach parity with the Big Three. Solar could cost half as much as its competitors by 2020. Rooftop solar is unlikely to become a truly viable form of energy for individual homeowners. It’s similar to making bread. A wheat farmer in Kansas grows, harvests and sells the wheat to a co-op. The co-op sells it to a transportation company that takes it to a flour grinder. A baker buys the flour from a middleman, bakes bread and sells the bread to a grocery store. Consumers buy it and get more consistent and less expensive bread than if they grew wheat in their back yard. Even though consumers can grow gardens, it doesn’t compare to producing energy by rooftop solar panels. The sun sets. Some days are cloudy. Mother Nature and the elements conspire to destroy panels and their inversion or mounting equipment. Everyone needs a reliable source of back-up energy from a power company. Most people will agree that producing electricity is more complicated than bringing bread to the market. Too much rooftop solar will change the economics of grid power. Put simply: If everyone had solar, the power companies would sell a lot less. When they sell a lot less, the price will go up. Today, the world relies upon the power companies to provide reliable power at a reasonable price. One more important point is that solar only generates when the sun is shining. Backup is critical for any solar installation. Nuclear and coal produce baseload power. They need to run 24 hours a day. When a nuclear or coal plant is shut down, it takes hours and even days to restart. Natural gas, on the other hand, can start in minutes. 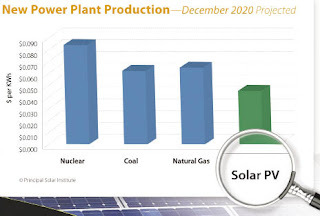 For this reason, solar and natural gas work well together compared with nuclear power and coal. Many calculations and approximations have been made on how many years supply of natural gas we currently have. Clearly, using solar as a supplement to natural gas will extend that supply. On the other hand, the Achilles heel of earth-based solar will always be access to sunlight. Because of this, many experts have suggested battery and storage methods. The best backup system is already on the grid in the form of natural gas and combined-cycle generation. In the final analysis, solar must be able to compete on an even playing field without subsidies. Based on the projections shown in this paper, that should happen in the coming years. A solid capitalist foundation will be the primary factor driving the coming “gold rush” in solar development. It is simply icing on the cake that solar energy is a carbon-free domestic energy source that is widely available. Unused land throughout the desert southwest represents an abundant natural resource of energy. More precisely, one county in west Texas sees enough sunshine to provide the entire electricity needs of the United States for the next 50 years. Still, it’s not likely that solar will provide much more than 15% of the total grid power. There are many reasons for this, almost all of which relate to the reliability of the grid. Solar PV has experienced exponential cost drops year-after-year for more than 30 years, with projections putting PV module costs at $0.50/watt, total system costs under $2/watt and output electricity at just under 6 cents per kWh — grid parity — in 2014. In the next three years, this nation will see a dramatic rise in utility-scale solar production that will support the existing infrastructure. Many will compare the next few years to a gold rush, as billions of dollars are made from converting sunlight to electricity. If America continues or expands a carbon-regulated market, solar will fill the bill with no fuel costs, low maintenance and carbon credits rather than carbon costs when compared to coal, nuclear and gas-fired power plants.